The originator of the most memorable variety act of all time … Dan has been seen on television in 22 countries, by millions of people! Immediately following Dan's appearance on the Tonight Show, Johnny Carson exclaimed - "Now that's show biz, folks!" 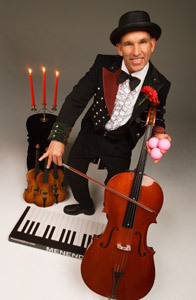 Dan Menendez combines comedy, juggling and music for his performace as "The Piano Juggler". The act is perfect for the intimacy of a television studio, or to captivate thousands in a large arena. Dan plays popular and classical music on the world's only "Bounce Piano" and "Bounce Cello". If you want originality in entertainment, book Dan Menendez for your special event. Performer Juggler Entertainer, Comic Juggler, Comedy Juggler Juggling Comedian, Musical Comedian, Physical Comedian, Visual Artist, Variety Performer, Funny Classical Music, Funny Musician, Variete Artiste, Visual Comedian, Prop Comic, Funny Piano Routine, Professional Freelance Independent Juggler, Stand Up Comedy, Theatrical, Malabarista, Clown Juggler, Victor Borge, Funny Cello Comic Cellist, Dan Menendez, Daniel Menendez, Half Time Events Television Performer Act, Cruise Ship Trade Show Performer Entertainer, Sporting Event, Banquet, San Francisco, Santa Cruz, Aptos, Salinas, Capitola, Soquel, Monterey, Carmel, Pebble Beach, Pacific Grove, San Jose, Oakland, Scotts Valley, Seaside, Berkeley, Sacramento,Winston Salem, North Carolina, New York, Los Angeles, Chicago, Orlando, Miami, Phoenix, Las Vegas and International.